Dr. White is Director of Thoracic Imaging, Department of Radiology, University of Maryland, Baltimore, MD. I will cover pulmonary embolism (PE), assessment of the lungs and lung parenchyma, and aortic imaging. We do this imaging on a 64-slice scanner and on a 256-slice scanner at the University of Maryland. Pulmonary embolism is a huge problem with a large number of cases that lead to about 50,000 deaths a year. There is an 8% fatality rate. And in a number of autopsies, going back 50 years now, about 70% of PE instances are overlooked. We think of venothromboembolic disease as being a systemic kind of disease, but the reality is somewhere around 25% of patients have symptomatic deep vein thrombosis (DVT). The diagnosis is a real challenge. There have been a number of attempts to devise criteria and tests like D-dimer to give us a better clinical sense, but these have their limitations. A lot of the diagnostic burden falls on the shoulders of imaging. 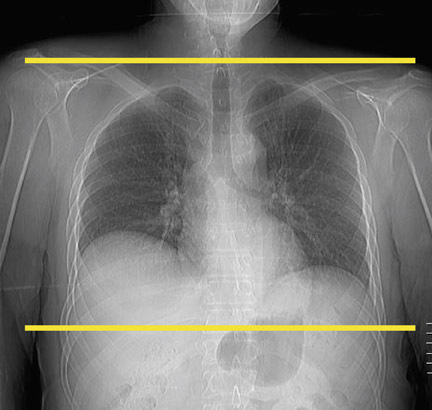 The chest radiograph is not a particularly accurate technique and pulmonary angiography is invasive. For the purpose of PE studies, ventilation/perfusion (V/Q) scanning has some value but provides many indeterminate studies. Leg studies are an indirect measure so the de facto gold standard in many practices, is computed tomography pulmonary angiography (CTPA). But even with that caveat, sensitivity and specificity were quite high (CTPA sensitivity 83%, specificity 96%, CTPA/CTV sensitivity90%, specificity 95%).1 And, in particular, the negative predictive value, meaning the likelihood of coming back with pulmonary embolism after a negative study, was really outstanding at 99%. Compare this with a V/Q scan, where if the result is negative, you do not know what is causing the patient’s symptoms as an alternative to PE. In the context of CTPA, there are many other diagnoses thatcould be seen and that could be causing a patient’s chest pain. The bad news is that there has been an incredible increase in utilization. 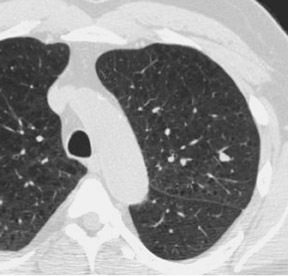 Since 1999 there has been an order-of-magnitude increase in the use of CT for PE detection. There has been a concomitant decrease in the percent positivity for PE, which is problematic. The percent-positive is down from about 15% to around 7% to 8%. Some of the literature suggests that it is down to 5% in some centers. So we have increased the volume enormously, and decreased the positive rate in the process. Couple that decreased positive rate with the national attention focused on CT radiation dose and we arrive at a major challenge. Comparing CTPA radiation dose with other techniques, we find that that it is close to invasive pulmonary angiography (standard chest CTPA 5 mSv to 10 mSv, invasive pulmonary angiography 6 mSv to 9 mSv). However chest CTPA is far greater than a chest radiograph (0.05 mSv) and somewhat greater than a full V/Q scan (3 mSv). In fact, chest CTPA is less than a retrospectively gated cardiac CT (10 mSv to 15 mSv) but is higher than a prospectively gated cardiac CT (2 mSv to 4 mSv). In addition to that, we have three general populations who are at even higher risk from radiation exposure: children/adolescents, young women and pregnant women. Some of the general strategies are controllable by the technologist and the physicians, and some are controlled by the scanner like dose modulation. We can control certain factors like the Z axis, the angular rotation and decreasing the kVp or mA. Z-axis coverage, or longitudinal coverage, can be reduced by excluding apices and costophrenic angles, and we can also increase the pitch and/or the slice thickness. For dose modulation, we can obtain diagnostic quality images at a lower dose, because the chest contains mostly air and there is an opportunity to modulate dose in a way that might not be available if one is scanning the shoulder or abdomen. We can decrease the kVp and mA and keep the image quality constant with a considerable reduction of dose.2,3 Similarly, although it is much more difficult, and less predictable, you can reduce the kVp and this could potentially increase the contrast in the pulmonary arteries. The mA is easier to adjust, and kVp is a little less flexible But KVP has the additional advantage of perhaps increasing your intravenous contrast enhancement. We have also tried to cone down the coverage (Figure 1). A normal chest CT is done from the apices to the upper abdomen, making sure the tips of the lungs are in the bottom of the image. This is not necessary with CTPA. And reducing the coverage area can lead to some dose savings. The estimates of organ-specific dose to breast tissue are variable. They range from 10 mGy to 70 mGy.This far exceeds what is recommended for mammography (3 mGy). Perfusion imaging actually gives a much lower breast dose (0.03 mGy), which is one of the advantages. According to some of the extrapolated data, a dose of 10 mGy may lead to an increased risk of cancer. One of the approaches to addressing this is using a bismuth shield, an in-plane shield, to try to reduce the dose to the breast.4 One study found a 41% dose reduction in women, without a change in image quality, as a result of using the shield. Others have had problems with near-field artifacts when using the shield and that is why it has not seen widespread adoption. In young women and girls, it is something that should be considered. Imaging considerations for the pregnant patient are similar to those in young women, to a certain degree. In these patients, however, the D-dimer may be falsely elevated. Since that is one methods of triaging patients, the fact that D-dimer is often elevated means that these patients are more likely to undergo CTPA than perhaps a nonpregnant patient. We must also be concerned about radiation exposure to the fetus. Other early data suggest that CTPA in pregnant patients may be less reliable. Whether that is because of flow artifacts, or valsalva maneuvers, is not entirely clear, but there are several studies suggesting that the nondiagnostic rate of CTPA in pregnant patients can be quite high. And for these reasons, this is one of the situations where venous leg ultrasound may be worthwhile. In these patients we can image the legs then look for PE. A positive test would be indicative of venothromboembolic disease, and then the patient would go on anticoagulants. In addition to the patient, we must be considerate of the fetus. And there have been a number of papers, some contradictory, about what the actual dose to the fetus may be. The dose is clearly higher now that we are using multidetector CT, because, with single-slice CT the dose to the fetus was generally viewed as being lower with CT than with a V/Q scan. In a study done of 16-detector CT dose at around conception, the dose from CT (0.24 mGy to 0.47 mGy) was comparable to V/Q 0.36mGy).5 But, at 3 months the CTPA dose (0.61 mGy to 0.66 mGy) exceeded the V/Q dose by almost twice as much (0.32 mGy). These results could influence which modality you choose in this population. Now, there are some caveats with this study. One is that the CTPA dose in the study was not optimized. There were factors that probably could have been optimized for the pregnant patient. Some of the assumptions that were made may be not as conservative as they could have been. It is also true that the V/Q scan dose can be decreased further. 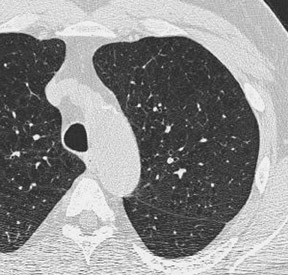 There are a huge variety of parameters that are used in clinical practice when dealing with lung parenchyma. A series of papers have reported kVp to range from 120 kVp to 140 kVp and the mAs can range from 100 mAs to 533 mAs.That said, we have the potential to reduce dose when evaluating lung nodules, following up a malignant diagnosis or when following up pneumonia or interstitial lung disease. There have been about 10 different papers evaluating lung nodules and they have shown that dose can be reduced by a maximum of 50 mAs without compromising image quality. Taking mAs below that threshold tends to produce mixed results. However, the National Lung Screening Trial, a lung cancer low-dose screening trial, uses 30 mAs. Figure 2 is an example showing the difference in dose. Clearly, the nodule at the right posterior costophrenic angle is visible with 200 mAs, as well as at 60 mAs, but it is still very diagnosable. With high-resolution CT (Figure 3) we use a lower dose on the axial scan. 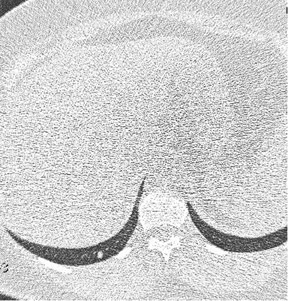 In this example, there is an apples-to-oranges comparison here but you can see that the axial imaging is at least as good as, if not better than the helical scan. 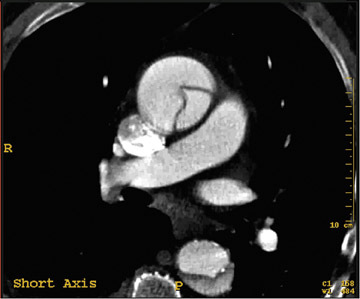 Obviously, CT of the aorta is widely used. We can use it for aortic dissection, aneurysm, and to assess trauma. But there are some huge challenges, including the large area to be covered, which includes the entire chest, abdomen and pelvis. If you are running a dissection protocol, the pulsation artifact at the root can be a real problem at times. Therefore, ECG gating can be used to resolve some of the root issues. However, there is a potential increased radiation dose associated with that. With retrospective ECG gating (Figure 5), we can actually get a little more data on the flap. For instance, we can see the entry site. Also the flow in the true lumen is faster. It is a little bit more dense, and we can see what is called the “beak sign.” So there are some major advantages, potentially, to doing gating, but there is a radiation penalty. With the default protocols on our 256-channel scanner, we can also realize some dose savings by using prospective gating in the aorta. For a 30 cm nongated scan we are delivering about 7.6 mSv. Retrospective CTA of the same length yields about 19.2 mSv and when we use retrospective with dose modulation we are able to reduce the dose to about 11.5 mSv. For a prospectively gated study we are seeing about 7.4 mSv which gets us down to the level of a nongated study. So perhaps we can do prospectively gated aortic imaging with little to no dose penalty. Finally, in the pediatric population, we can use prospective gating to potentially reduce the dose below 1 mSv. In a personal communication, Dianna M.E. Bardo, MD, of Oregon Health and Science University, Portland, OR, related that she was able to deliver 0.9 mSv using an 80 kVp/120 mAs scan with 18 cm of coverage that was acquired in 8 sec. These are impressive results and show that we can use the tools available today to optimize image quality while reducing the radiation dose for chest indications. Stein PD, Fowler SE, Goodman LR, et al. 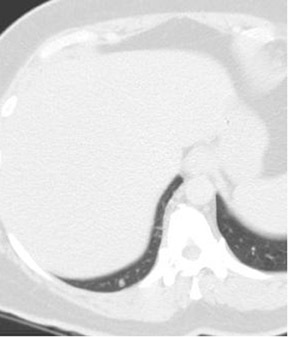 Multidetector computed tomography for acute pulmonary embolism. N Engl J Med. 2006;354: 2317-2327. Tack D, De Maertelaer V, Petit W, et al. Multi-detector row CT pulmonary angiography: Comparison of standard-dose and simulated low-dose techniques. Radiology. 2005;236:318-325. Schueller-Weidekamm C, Schaefer-Prokop CM, Weber M, et al. CT angiography of pulmonary arteries to detect pulmonary embolism: improvement of vascular enhancement with low kilovoltage settings. Radiology. 2006;24:899-907. Yilmaz MH, Albayram S, Yasar D, et al. Female breast radiation exposure during thorax multidetector computed tomography and the effectiveness of bismuth breast shieldto reduce breast radiation dose. J Comput Assist Tomogr. 2007;31:138-142. Hurwitz LM, Yoshizumi T, Reiman RE, et al. Radiation dose to the fetus from body MDCT during early gestation. AJR Am J Roentgenol. 2006;186:871-876. Pahade JK, Litmanovich D, Pedrosa I, et al. Quality initiatives: Imaging pregnant patients with suspected pulmonary embolism: What the radiologist needs to know. Radiographics. 2009;29:639-654. Radiation dose considerations in the chest. Appl Radiol.